Oh, a tug at the old heartstrings. I was in Wal-Mart yesterday, attempting to locate a suitably chubby mum (mums are like chickens - thin equals bad), when I started flipping through the October House Beautiful and completely forgot about seasonal florals. 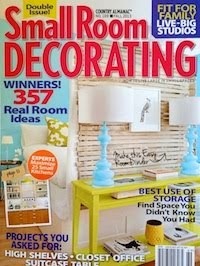 It's a gorgeous issue! Loads of beautifully colored spreads, genius tips, chinoiserie everywhere, a dreamy tablescape by William Yeoward - and the Barefoot Contessa does kitchens!!! Seriously, why are you still sitting at your desk? My favorite pick - this bedroom by Meg Braff. I have an abiding love of green and white. Feelings run deep. I saw this spread not 45 minutes after purchasing a 5-piece green and white overlapping squares patterned desk set. Coincidence? I think not. Another Braff bedroom. The five reasons this room excels: 1. Chinoiserie. 2. Toile. 3. Zebra. 4. Sky blue. 5. All together. Beautiful! Visit her website for more wonder. That's all for teasers. You'll have to buy the issue! If you're not a subscriber, but you ARE a Sam's Club member, get your HB (and Vogue, Victoria, etc.,) at the same time you're buying enough kleenex boxes to supply Bulgaria. They offer a discount off the cover price. Be sure not to miss the Technophobia article on p. 48 of this month's HB. It includes a special reader's invitation to join the FABULOUS home discount sites Gilt, One Kings Lane, and Rue La La, with none of the usual "wait list" time. I'm a member of all three, and believe me, it's worth it. yum. i love a green room! my bedroom is Laura Ashely's "Glass Green" & i love it. are there wait lists now for those? I'm a subscriber too and it's a bit of a catch 22 (I probably spend more than I need to! But great deals). I agree -- HB was in top form this month! Btw, just gave you an award on my blog today. Stop by and pick it up! Averill - Thank you! You are so sweet! 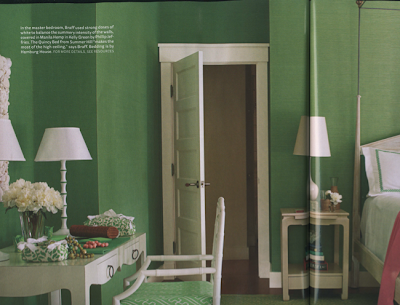 I absolutely love that green Braff bedroom, too, Skyla! It's so fresh and classic. Hope that you have a great weekend! 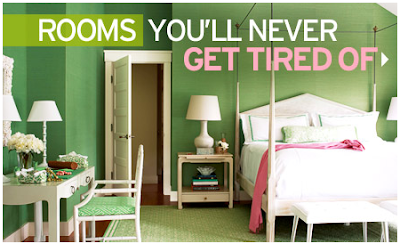 that might be one of my favorite green bedrooms EVER. i definitely need to pick up this issue. I just subscribed to HB--they have a year for $12 deal ...another that I signed up for was HB plus Veranda for $22 total.